Machine learning is an application of artificial intelligence that enables computer programs to learn and improve automatically as they are exposed to new data, without being explicitly programmed. Artificial Intelligence (AI) is the ability of a computer to mimic human cognitive skills such as learning and understanding. Machine learning refers to the ability of AI systems to take in data through observations and interactions and adapt accordingly. Essentially, machine learning models program themselves. Futurists predict that every facet of our lives and every line of business will eventually be transformed by machine learning. A wealth of computing resources and large data samples have pushed AI further and faster than we ever expected. Development trends have moved away from monolithic applications and toward the adoption of APIs and microservices. Business-to-consumer communication has created new business cases for messaging bots, which is driving even greater adoption of this technology. Machine learning algorithms are at the core of Twilio's most advanced communication deployments. From individual developers to major enterprises around the globe, Twilio powers the natural language understanding and dialog management of their entire customer experience. Businesses increasingly use machine learning to communicate with their customers. For example, messaging bots provide automated responses based on message analysis by using technologies such as natural language understanding (NLU) and intent extraction. Twilio created Autopilot, a conversational AI interface for applications such as messaging bots, interactive voice response (phone IVRs), and voice assistants. Powered by Twilio’s natural language understanding and machine learning frameworks, Autopilot parses data, intent, and tasks from customer interactions to support natural conversations. Autopilot provides the training pipeline and interfaces using real-time data, so conversational applications keep learning over time and get smarter with every conversation. Autopilot smoothly transitions the automated conversation to a conversation with an agent on nearly any channel, passing along the full context of the interaction. Developers only need to design, train, and build an Autopilot-powered application once to have it work with all existing (and future) channels, including Voice, SMS, Slack, Google Assistant, and Alexa. NLU is branch of natural language processing (NLP), which helps computers understand and interpret human language by breaking down the elemental pieces of speech. Speech recognition and text analytics are powered by statistical machine learning methods which add numeric structure to large datasets. Of course, understanding language requires more than finding statistical patterns in numbers. That’s where machine learning helps NLU models improve over time as they learn to recognize syntax, context, language patterns, unique definitions, sentiment, and intent. 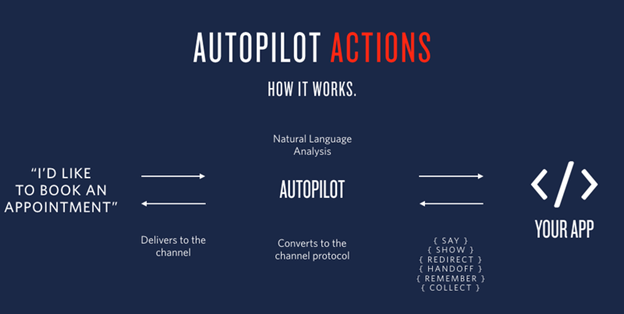 Autopilot’s NLU engine uses machine learning to understand what people are saying, as well as their intent—turning text from spoken and written language into structured data that virtual assistants and other applications can leverage. It can be easily trained to recognize the intent and entities of natural speech and then trigger the appropriate actions or replies, connecting the dots between conversational input and specific tasks.